The 2017 Cruise Critic UK Cruisers' Choice Awards - decided by online reviews on the website Cruise Critic - decide the favoured operators in categories such as Best Cruises Overall , Best Cruise Ships for Dining and Best Cruise Ships for Value . Adam Coulter, UK editor Cruise Critic, said: "Overall, the cruise industry excels in its offerings to travellers - from phenomenal entertainment to exceptional service - and these awards highlight the cruise lines that travellers rank as particularly outstanding, in order to assist those planning a cruise. "Travellers increasingly consult consumer reviews and photos for guidance when researching, and these awards aim to streamline this process further." Anyone taking a cruise should take out specialist cruise insurance. The awards are categorised into three ship classes, based on the number of passengers it welcomes on board. 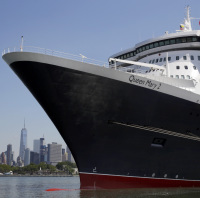 The 'large' category has the capacity for more than 2,000 passengers; 'mid-size' carry between 1,200 to 1,999 passengers; while the 'small' ships welcome fewer than 1,199 passengers. Mid-size operator Oceania Cruises stole the show with the Riviera coming top in its size category for six different accolades. These include the preferred choice overall as well as cabins and dining. The firm is also merited for best embarkation, best public rooms and best service. Smaller firm Viking Ocean Cruises also featured highly as a preferred choice across eight of the 12 categories, with its Viking Star service scooping five awards and its Viking Sea service winning three. Large liner service Celebrity Reflection also took home three awards, as did mid-size cruise Thomson Spirit. The Royal Caribbean also did well, with its Harmony of the Seas being voted best for families and Freedom of the Seas the best for first-timers, and its Ovation of the seas being the preferred choice for fitness and recreation. Norwegian's two large liners - the Epic and the Jade - were winners in the embarkation and entertainment categories respectively. Other winners include the Saga Sapphire for dining, Celebrity Silhouette for public rooms and service and P&O's Oriana for fitness and recreation.